So you've made it through Thanksgiving and find yourself with a good amount of turkey leftovers. You've already worked your way through our leftover Thanksgiving sandwiches, but now are looking for something new and exciting to try. This pizza recipe is an optimal solution! 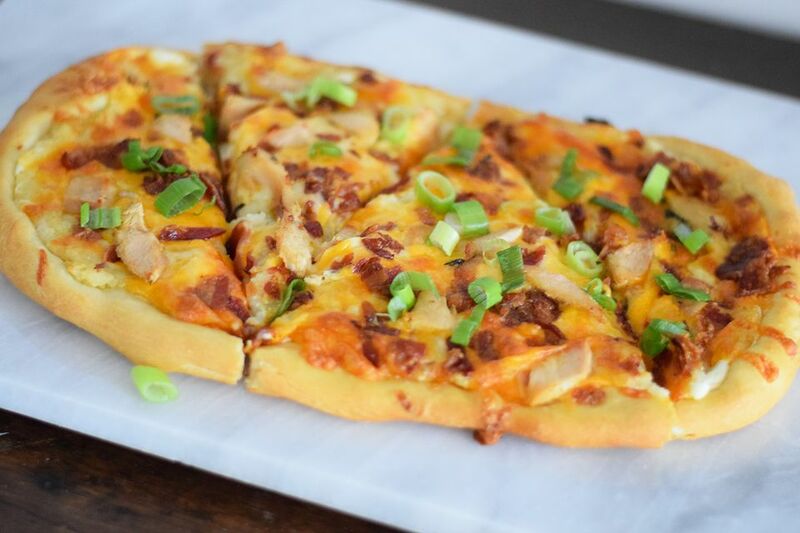 Using leftover mashed potatoes and turkey on a crispy homemade pizza crust (or store-bought if you're in a time crunch), we smother the top in cheese and bacon. Top it with some scallions to compliment the creamy potatoes and savory bacon and you have yourself a leftovers dinner winner. If it's not Thanksgiving, but you still want to make this recipe you can omit the turkey and the pizza will still essentially taste the same. Or you can add other proteins like chicken or ground beef to try a different flavor. Want to be even more daring? We suggest drizzling it with barbecue sauce or hot sauce for some extra zing and pep. In a large measuring cup, stir together the water, yeast, salt, sugar, and olive oil. Let it sit for about 10 minutes. You should see the yeast start to bubble and grow. Place the yeast mixture in a large bowl or the bowl of a stand mixer. Gradually add the flour, stirring or using the dough hook attachment until the flour is completely combined and the dough forms a ball. Add olive oil to the sides of the bowl and cover with a towel. Place in a warm area or just on the counter and allow it to rise for one hour. Fry or bake the bacon until crispy. Chop the bacon into a small dice. Punch down the dough and roll into into a soft ball. Place the dough on a large sheet of parchment paper, lightly grease your hands with oil, and push and flatten the dough to form the crust. Once it is thin enough (about 1/8-inch thick), spread the sour cream over the crust. Spread the leftover mashed potatoes over the sour cream. Sprinkle the two cheeses over the top of the potatoes. Top with the leftover turkey and bacon. Bake on the bottom rack of the oven for about 15 to 20 minutes, or until golden and crispy.